I almost didn’t buy this because the illustrated fabric pattern here is a dead ringer for some wallpaper my parents once had. (The dots were brown and blue on a beige background. I disliked it quite a bit.) 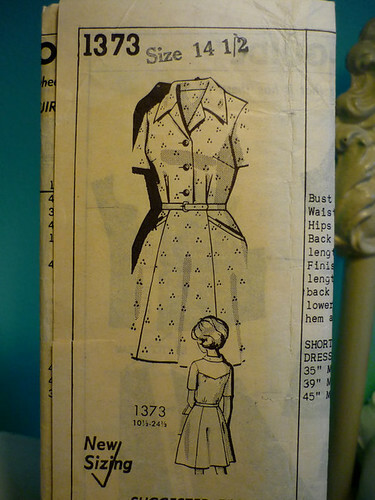 But I will make this dress in something spare, perhaps a nice crisp gray shirting cotton. Or maybe checks! ehh – i can see pleats only at the bodice. cero in the skirt in this picture. ??? it looks just like a simple 6-piece A-line skirt to me. if i could see the pattern……. Shirtwaist dress–the classic American style! You are showing your good sense of fashion history. And as someone who also took a lot of Latin, I love your joke about arms and the man. HIT by a CAR!!!! sheesh girl, I sure hope you had that helmet on…and that you aren’t too beat up. (how’s the bike?) Street riding is no joke, to me it’s best taken on by those guys wearing day-glo greenish yellow vests over their team riding kits. You know, those guys who beat the traffic to each signal the whole way down El Camino Real in the morning. Dress pattern: this is a ‘half size’ pattern, meaning that it’s shorter in the back length (and bigger in the bust) than the ‘missy’ patterns–are you OK with that? It’s got a 70’s length and collar style too, which could be really cute with piping, like you say, but I’d turn the bust tucks into darts for a smoother fit. I definitely had my helmet on. 🙂 And my bike was fine but I managed to get a hole in my dress, which was more upsetting! To me, patterns in the ‘half size’ range should really be called ‘curvey petite’, rather than the original target customer: grandma. Not many fashion sewers are aware of how great a fit this is for the petite figure. Oh my gosh, I’m so glad you’re okay. Congratulations on Wordnik going beta! Wooooo! For some reason my mind read “Latin Dance teacher!” Then when bartending and biceps were added in, I started to swoon a little. Mmmm…. The yoke is the best part of that dress! You should make it in stripey something and cut it on the bias. 😉 Rather impulsively, I ordered a vintage shirtdress pattern from Etsy last week…although now that I inspect it closer, it looks a bit like a lab coat! Yerp. So glad you are okay! Shirt dresses are classy. Agree with you on the newspaper patterns, but I’ve run into the same thing on “expensive” name brand patterns, too, where the actual finished product is not what the picture shows or pattern pieces don’t line up. Good luck. I have an Amy Butler pattern, Liverpool Tunic and I have made it twice and I feel like the third one will be perfect. : ) I always get compliments on the first two even though I still need to adjust the pattern. I agree with you on the piping. I saw a great child’s tunic in black with peppermint stripe piping. Quite darling. Can’t wait to see yours. Wow – so glad to hear you’re OK after being hit by a car!!! It’s a good thing I wasn’t drinking anything when I saw “the arms and the man” punchline. I’m a huge fan of shirtwaists, especially early-Sixties shirtwaists which are insanely flattering on my pear-shaped figure. 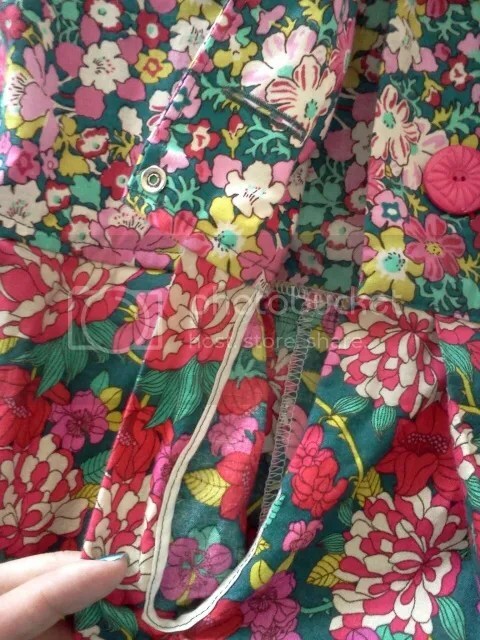 In fact, the last dress I made for myself was a Liberty of London shirtwaist (http://wesewretro.com/2012/10/liberty-shirtwaist/) and I felt like I was channeling Erin the whole time. I particularly love shirtwaists for using really wacky novelty prints, and on a related note, Nancy Drew Fabric! If I don’t make a shirtwaist dress out of that book-spine print, my life will have been for naught. I really like the front placket, the way it is hidden behind a pleat, and eliminates the need for a side zipper! I did put in a snap at the waist to keep it closed. Oh, awesome, that is very helpful, thank you!